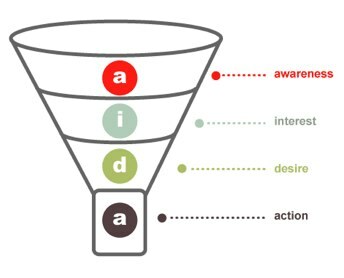 We should all be aware of the sales funnel. At the top is when potential prospects are introduced to a brand, product, or service. At the bottom, they ready to take action. But when and how to target these users is rarely discussed. For starters, we should do a quick refresher on the type of queries. 10% of all search queries are navigational queries. These are users that search for a company’s brand name or page on an engine because that’s the easiest way for them to navigate to where they are trying to get to. Branded campaigns are designed to handle these, as are campaigns meant to target a competitor’s terms. The next 80% of all search queries are informational queries. These are the ones where a user is merely investigating a subject. They may be at the awareness or interest level. A user at the awareness level might be looking for how to get a home. A mortgage company may help answer the question, but they may compete in the same ad space with a real estate company or a house-locator site. As a mortgage company, a user at the interest level might be looking at how mortgages work. The last 10% of queries are considered commercial or transactional queries. A user at the desire level would be looking into the best types of mortgages, while a user at the action level has pretty much decided that they’re getting a mortgage. They just need to find the best one. If we target transactional queries, we get the most immediate gratification. The users that click our ads on these searches are far more likely to “convert” quickly. We may get them to buy or complete a form within 30 minutes, depending on our buying cycle. They also offer us the simplest path to proper attribution. But these queries are not without their limit. Google is not an endless pit of the queries we want. We can do everything possible to maximize them, and we should should. But once we have tapped those, we need to begin expanding our strategy. Information queries are frequently much cheaper and have lower competition. We can often get these users early in the game. If successful, they may never even see a competitor’s ad. Heck, combining these with an effective content strategy may help enhanced eve the highest performing PPC campaigns. Writing ads that target the top of funnel queries is one thing, but the decision to target them is a whole different ball game. We are often forced to deal with the fact that we do not have the landing pages and sales processes including email drip campaigns and whitepapers to handle the informational queries. Suffice it to say, these can be very effective queries to target, but we may not be properly handling them early in our efforts. It’s a process. Either way, the targeting methods to target, segment, and exclude any of query types are tried and true. Using the proper keywords, negative keywords, and bids are our better ways. Display branding campaigns can be used to trigger the user searches, assuming we’ve begun hitting our upper limit on effective search campaigns. Display direct response campaigns can be another way to hit top of funnel users, although there is no query associated. This is the balancing act we need to play as marketers and decide. No matter what our decision, effective segmentation and a strategy to answer the user questions should be baked into the plan.